Art & Beyond is promotional services for artists in form of both Online and Print Edition Magazine with 108,500+ readers as of today. Cover Competition is included in the Entry Fee of $95.00 for Full Page. You may apply with up to 7 images with an additional payment of $7.00 per image. Use the PayPal button below. Two-Page Spread is also available to apply with up to 5 images in a price of $185.00. Use the drop down PayPal menu under Entry Fee button. Please fill out application below then get back to this page and make a payment. 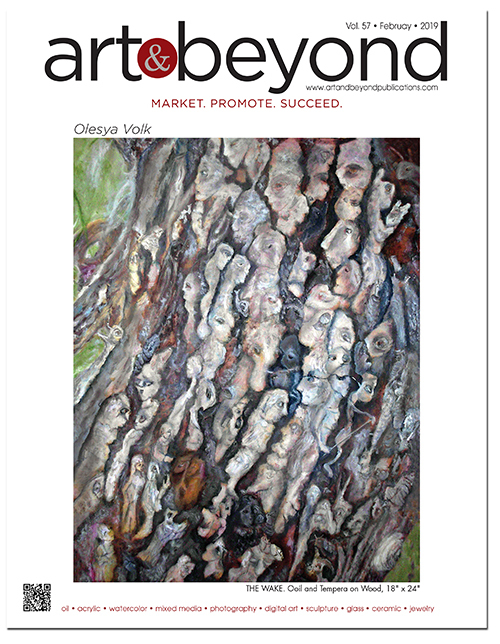 All entries submitted the Art & Beyond Magazine Online must be original work. The artist must be the sole owner of the copyright of the submitted images/artwork. Artists accepted to be exhibited and published will retain full copyrights of their images. Submitting the Entry Form gives Art & Beyond Studio, Inc. the authorization and permission to utilize submitted materials for publication as well as marketing purposes including publicity by Art & Beyond Studio, Inc. If for some reason after you applied and made a payment for a Competition you decided not to participate in it the refund amount of your payment will reflect the service and transaction fees (which will be subtracted from the amount you paid). Please make your decision for participation wisely.